Robert J. “Bob” Daly – in Woburn, November 18th at eighty nine years of age. Beloved husband of the late Dorothy E. (Downey) Daly. Devoted father of Robert J. Daly Jr., his wife Gail of Woburn, Edward Daly, his wife Elana of N. Reading, Deborah Daly of Wilmington, and Scott Daly of Middleton. Dear brother of the late Mary Phillion, John “Jack” and Charles Daly. Cherished grandfather of Nicole Kenny, Emily Salemi, and Rebecca Doherty, Casey Chevers, Katelyn Acker, and the late Bryan Cadigan and great grandfather of nine great grandchildren. A Funeral will be held from the Lynch-Cantillon Funeral Home, 263 Main Street, Woburn Wednesday, November 21st at 9 a.m. followed by a Funeral Mass in St. Barbara’s Church, 138 Cambridge Rd.,Woburn at 10. Relatives and friends are respectfully invited to calling hours at the Funeral Home, Tuesday, 3-7 p.m. At the families request remembrances may be made honoring Bob in memory of his late grandson Bryan Cadigan, to the Melanoma Treatment Center, Dana Faber Cancer Institute, 450 Brookline Avenue, Boston MA. 02215-5450. Robert J. “Bob” Daly passed away at the Winchester Hospital Sunday, November 18th. The beloved husband of the late Dorothy (Downing ) Daly, Bob was eighty nine years of age. Born in East Boston, Bob was the son of the late Charles M. and Agnes (Cane) Daly. Raised in Burlington, Bob was a graduate of Burlington High School along with the Class of 1947. Bob married his dear wife Dorothy, to whom he was devoted for fifty six years. In 1961, they moved to East Woburn, where they raised their four children. Summers were always an adventure in Hampton Beach over the years for vacations. They always enjoyed hosting backyard cookouts over the years on July Fourth, Labor Day and Memorial Day. Bob had worked as a machinist for Bay State Knife for a good number of years and then McLean Trucking. 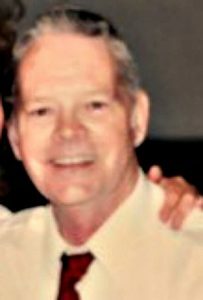 Bob began working for the Woburn School Department where he was a very well known custodian at the Shamrock Elementary School. Bob always had a smile and a kind word for both teachers and students, taking great pride in his work, and it showed! Bob was a very kind and gentle man, who had great devotion to his wife, grandchildren and greatgrandchildren. Sadly, Bob was predeceased by his wife Dorothy, grandson Bryan Cadigan , along with his siblings Mary Phillion, John “Jack” and Charles Daly. He is lovingly survived by his devoted children Robert J. Daly Jr., his wife Gail of Woburn, Edward Daly, his wife Elana of N. Reading, Deborah Daly of Wilmington, and Scott Daly of Middleton. Cherished grandfather of Nicole Kenny, Emily Salemi, and Rebecca Doherty, Casey Chevers, Katelyn Acker, and great grandfather of nine great grandchildren. A Funeral will be held from the Lynch-Cantillon Funeral Home, 263 Main Street, Woburn Wednesday, November 21st at 9 a.m. followed by a Funeral Mass in St. Barbara’s Church, 138 Cambridge Rd.,Woburn at 10. Relatives and friends are respectfully invited to calling hours at the Funeral Home, Tuesday, 3-7 p.m.. At the families request remembrances may be made honoring Bob in memory of his late grandson Bryan Cadigan, to the Melanoma Treatment Center, Dana Faber Cancer Institute, 450 Brookline Avenue, Boston MA. 02215-5450. A Funeral will be held from the Lynch-Cantillon Funeral Home, 263 Main Street, Woburn Wednesday, November 21st at 9 a.m. followed by a Funeral Mass in St. Barbara’s Church, 138 Cambridge Rd.,Woburn at 10. Relatives and friends are respectfully invited to calling hours at the Funeral Home, Tuesday, 3-7 p.m.. At the families request remembrances may be made honoring Bob in memory of his late grandson Bryan Cadigan, to the Melanoma Treatment Center, Dana Faber Cancer Institute, 450 Brookline Avenue, Boston MA. 02215-5450. You are with your love and Bryan now! Rest in peace! You will be missed! I worked with Bob at the Shamrock School until 1981 when I was transferred. He was an awesome guy to work with. Bob was proud of his job, always had a smile on his face, and was willing to help whenever needed. I worked at many schools since then but he and Ed McCall are the only custodians that I remember. You were a great part of my childhood, I wish I could be there, living in Florida. RIP Bob, I will always remember your vibrant personality and kindness! A truly special man. My heart aches for you and your family Deb, my soul sister and best friend. I wish you peace and wonderful memories. What a amazing soul,love and peace for all of you. We are sincerely sorry for the loss of your Dad. Papa you will be greatly missed. You were a wonderful husband, great role model for a dad, a loving grandfather and a sweet great-grandfather. Nobody could have asked for more from you. Rest In Peace with nana and Bryan and in the arms of God. Uncle so sorry we cannot be there to say goodby. You will never be forgotten for how could someone as gentle, loving, and caring as you ever be lost in memory. Thank you for always being there for me growing up and for the family. You are now reunited with the love of your life and we all know you will be at peace eternally with each other. Rest now, Uncle, your work is finally finished.